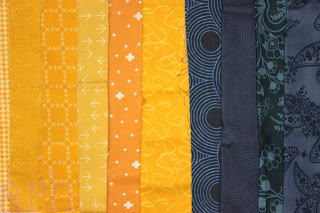 I have a lot of "different" fabrics and had fun pulling from my stash to complete these. I do hope that they play well with the rest of the blocks that are being sent her way. 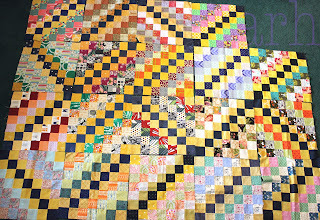 These were fun to make, I’m sending these blocks along with the extra hst. Hi everybody, I've chosen Hidden Gems designed by Diane at From Blank Pages, I just love her work! Coloring pages that help with fabric placement - I almost always take a few minutes when starting a new paper piecing pattern to at least a rough-in the colors so that I can double check the layout as I go. 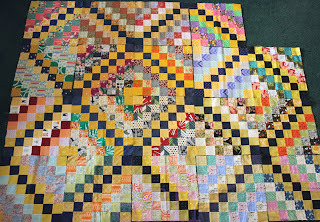 The block went together really well, her patterns always do. I will say I was really glad to have basted the last seam (the long diagonal). I pulled it out and pinned some of the points - even though it's on a paper foundation, it was a little touchy. A pin or two, or some clips, will make it much more stable and the points should come together just fine. I'm Liz from Virginia and I'm your Queen Bee for the month. I'm an affordable housing Architect and mom to a busy 4 year old. I just recently conquered 2 of my biggest sewing fears by participating in a New York Beauty minim-quilt swap. 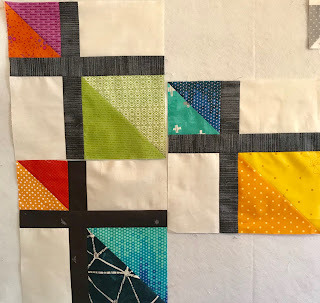 Those fears: drafting my own paper piecing pattern and curved piecing! Joining a swap and wanting to impress my swap partner was the push I needed to dive in. My next sewing fear is making a quilt for my hubby and you all are going to help me do that. So for our question of the month; What is your biggest sewing fear? What would help you overcome it? 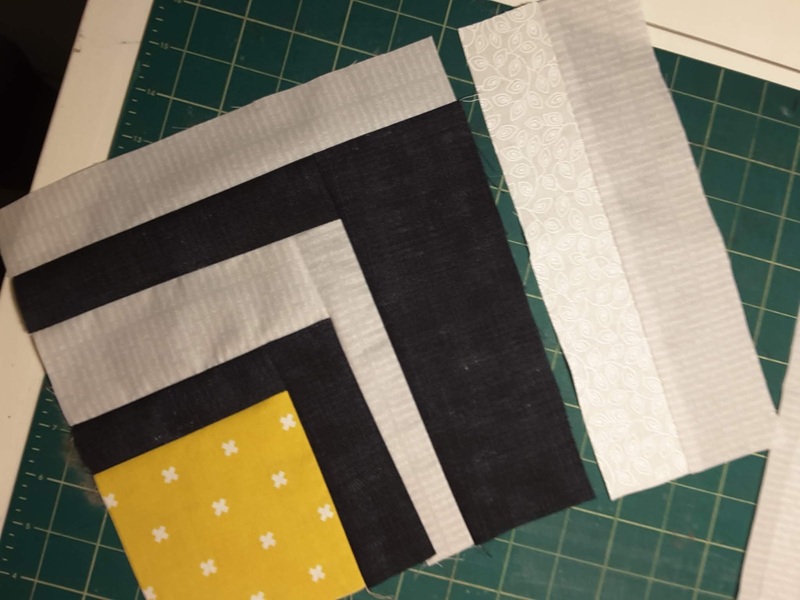 Size: Please make either a 12x12 or a 12x16 block. Your choice! 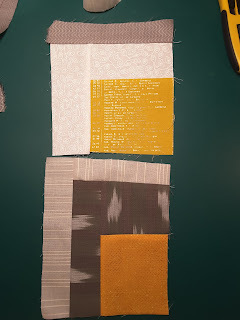 Colors: I'd like you to use neutrals similar to the RK example for the stripes. For the dark stripes, medium / dark grey, black, chocolate brown, and navy blue are all ok. For the light stripes, white, cream and light grey are all good. 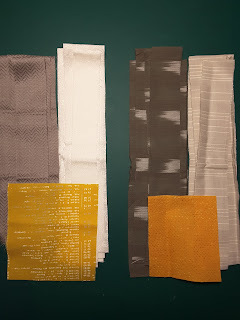 These can be tone-on-tone, solid, or a small / medium scale pattern that still reads as a neutral color from a distance. 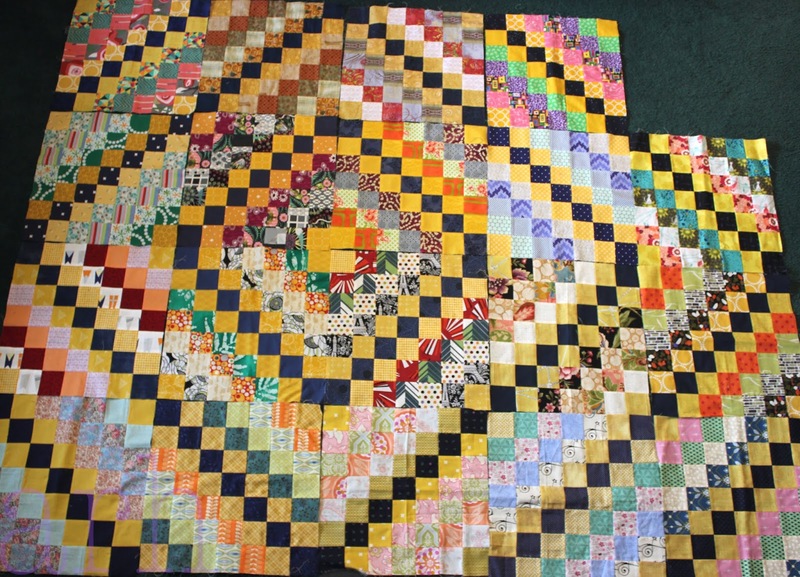 Please use a fully saturated yellow or orange for the center "hearth" square. Fabric: I'm looking for fabrics that say "men's clothing." 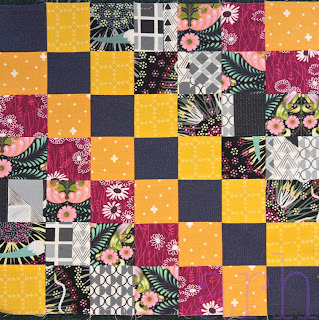 If you have a great fabric in your stash that is not a quilting cotton, I'm giving you permission to use it here! I'd recommend you stick with woven fabrics that are a typical clothing weight (as opposed to knits, upholstery, etc.) I'm planning to use some lawn, chambray, linen and a cotton/linen blend. Avoid fabrics that are not machine washable though. If you use one of these, pick a traditional quilting cotton for your other 2 colors in your block to help with stability during sewing. 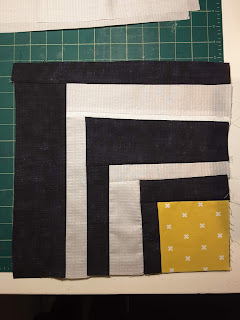 You'll need between a fat 1/8 and a fat 1/4 of each stripe color. 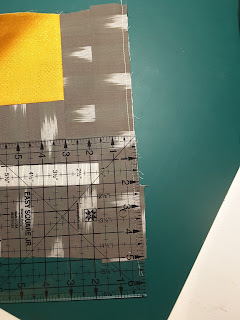 If you need to work in some scraps of other fabrics, it's ok as long at the colors still fit the bill. Cutting: Stripes should be about 1" to 3 1/2" wide - depending on your fabric length, you'll probably need 3-5 strips of each color. 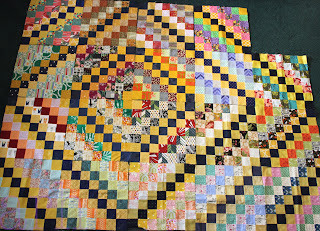 Your center yellow/orange piece should be about 3" to 6" on each side. 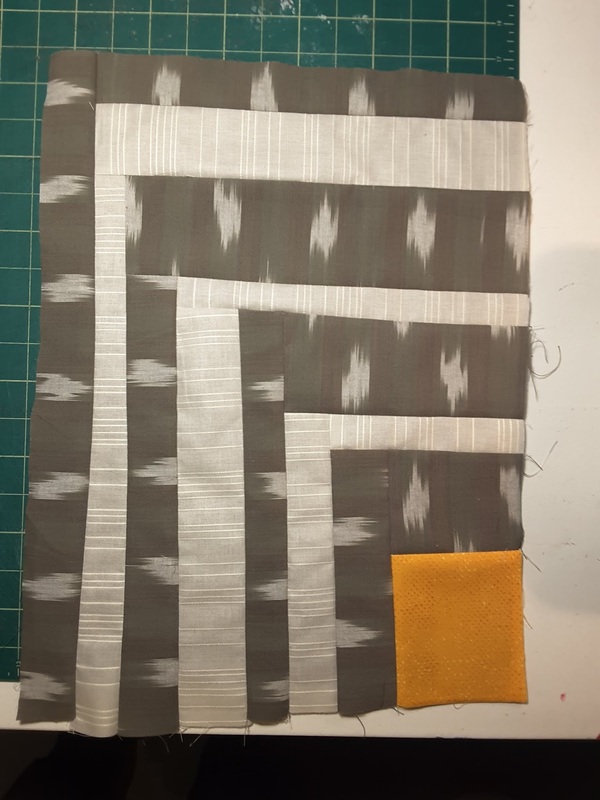 I decided this one needed a white pinstripe inside one of the lighter stripes - sewed a leftover strip from another block to the light grey and then trimmed it up to leave 1/4" exposed in the final block. 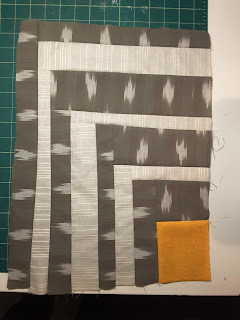 Can you see the pinstripe in the block below? 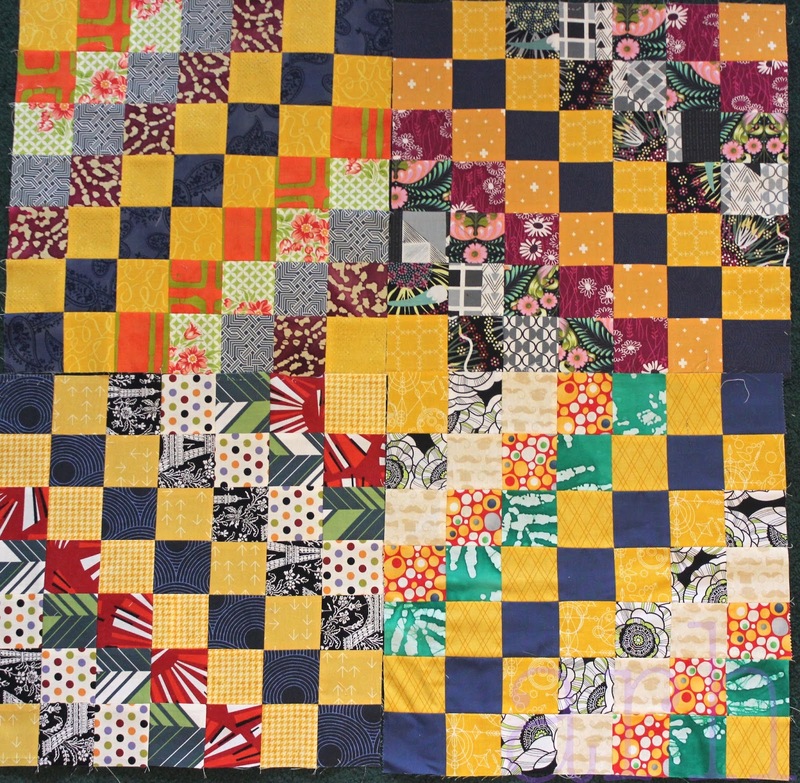 I will arrange all pieces with the yellow/orange in the bottom right corner, so keep that in mind as you piece. If you make a 12" x 16" block, it should be 16" tall. Please send untrimmed. I'll do the final trimming after I see all of the pieces together. Thank you so much and Happy Sewing!!! The 12 inch block to be made for me in April is one that I also chose when I was part of a different block swap. 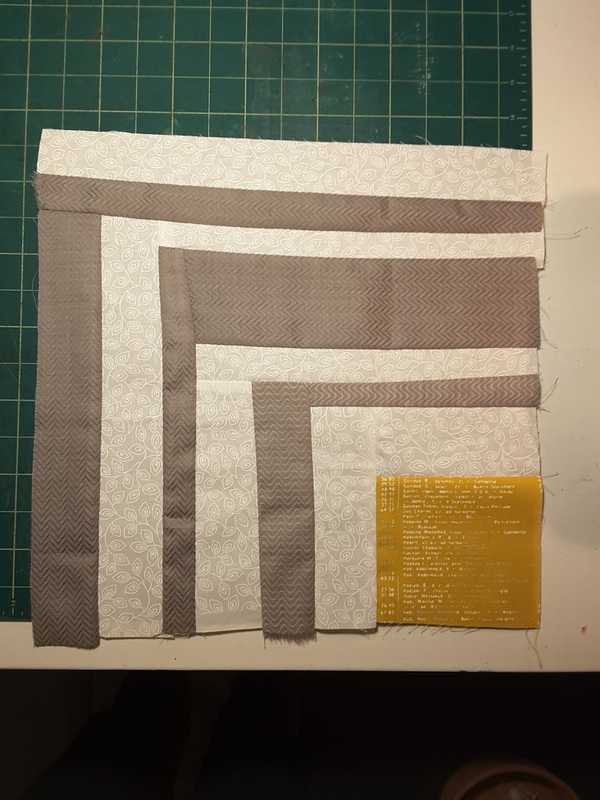 With what I receive this month, I should have enough to make quite a nice quilt. I have minimal fabric or color instructions. 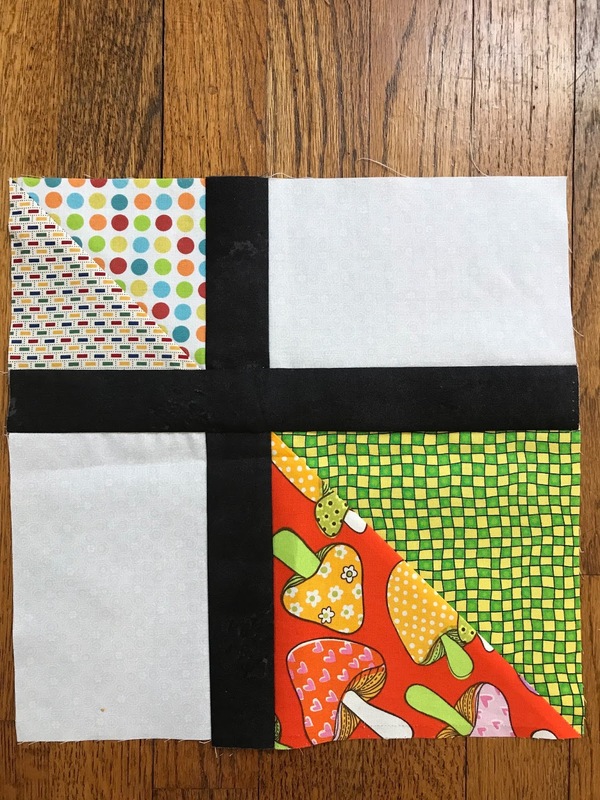 The half square triangles can be any color, and can be solid or print. Pick interesting patterns or textures. No flowery (girlish) fabric is my only no-no. 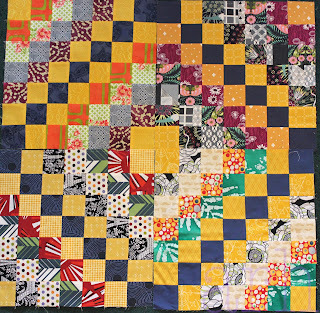 I'd like the quilt I make with the blocks to be suitable for either a girl or boy. 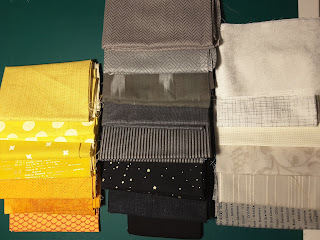 Sashing can be black or dark gray, solid or print. Thanks for taking part and helping me. Here are a few I already have with one possible layout choice. Aren’t these blocks beautiful? They’ve been languishing in my WIP drawer and I think it’s high time they get some more friends. 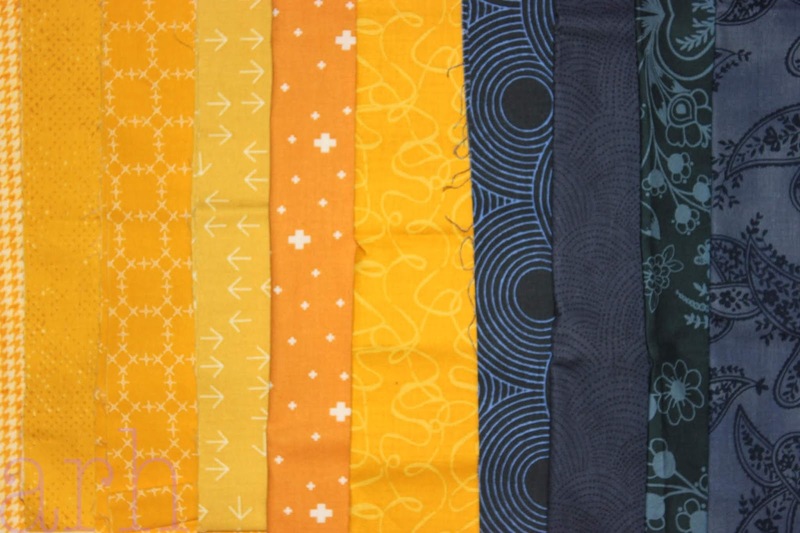 I’ve collected many more navy prints since, but sadly not a lot of the yellow/mustard. Check out the details at the link above and let me know if you have any questions. 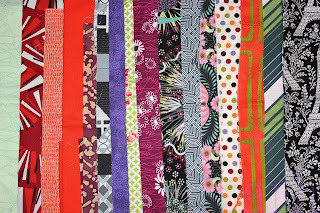 I can’t wait to see what fun, scrappy fabrics you choose! March has been a trying month in our house! My oldest had a stomach virus he just couldn't seem to shake, then my husband got a concussion playing soccer; between taking care of them, going in for a minor medical procedure myself, and a crazy busy month at work, sewing took a back seat. 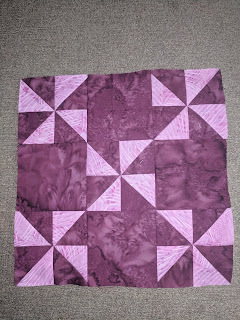 I finally had a chance to sit down and get my block done for the month yesterday. I hope this works well with the others! 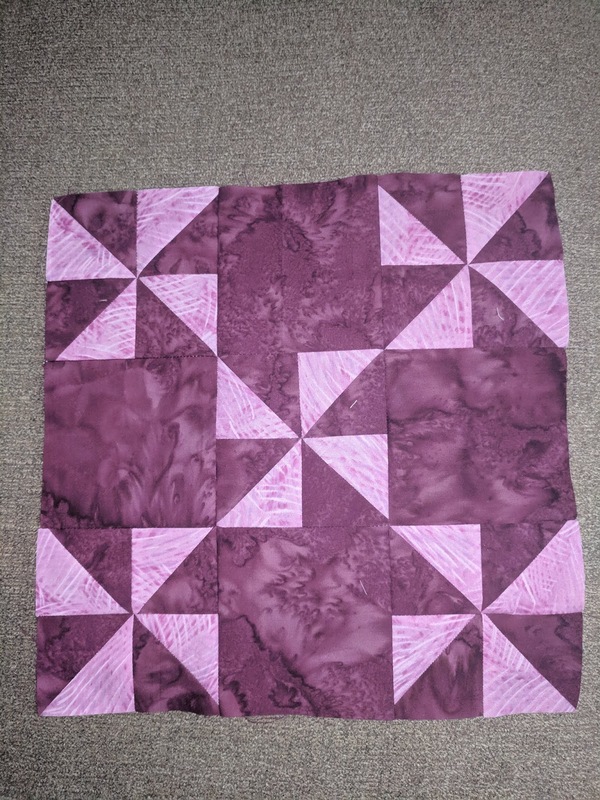 The light purple looks more pink in this picture than it is. In person it is definitely purple.